Prior to departing to Bali, I had read about hiking one of the volcanoes called, Mount Batur which is at a height of 1700 meters (5,577 ft.) . I enjoy hiking and wanted to try and hike to the summit. 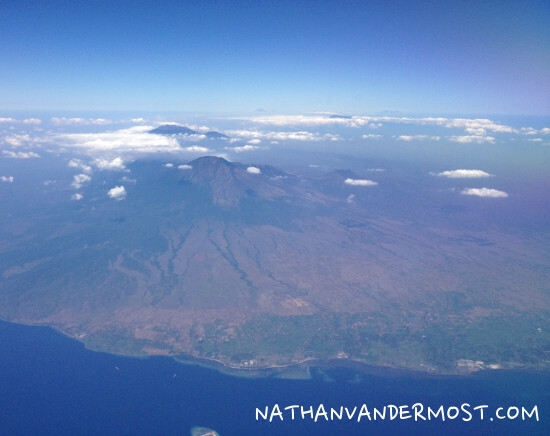 The volcano is on the northeast part of the island and I was closest to it while staying in Ubud. 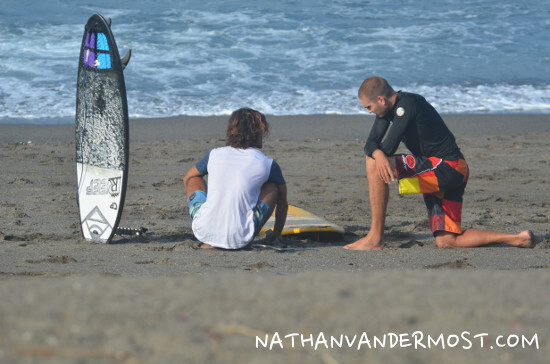 There are many tour operators in Ubud and around the island that offer a package deal which includes, providing transportation, breakfast and a guide to the top of the volcano. 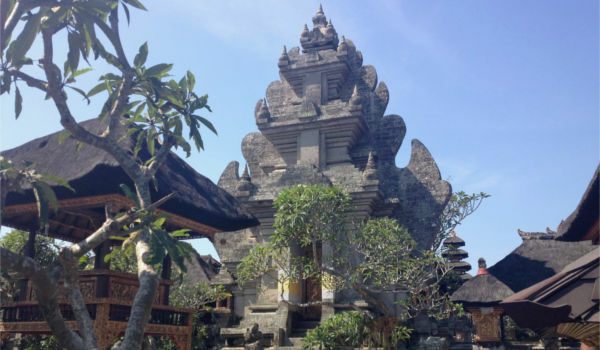 The cost of these tours ran from 250,000 to 350,000 Rupiah ($20-25 USD) but the guest house I was staying at offered a deal of 200,000 Rupiah ($16 USD). After researching guiding services online and asking around, I thought it would be more exciting and adventurous to motorbike to the volcano and hike it by myself! I was somewhat hesitant while contemplating this idea because the volcano is a 1 hour drive from Ubud on unknown roads in the dark. Additionally, I have read that tour operators frown on tourists that go by themselves because they are essentially lost customers. I had also read blog posts of other travelers that had negative interactions with tour guides including aggressive behavior towards them. 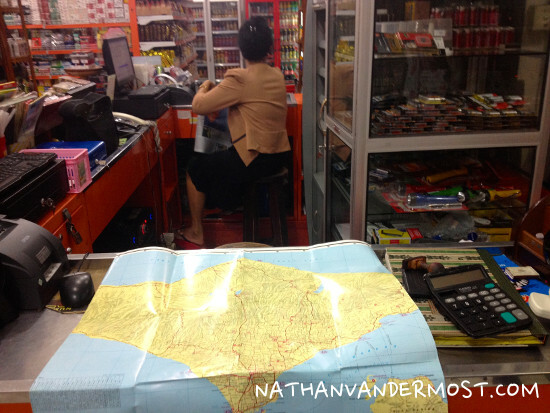 It was 7pm the night prior and I was trying to find a map of the road system so I knew which direction to go. Most guided services advertise an early departure so that you can summit for sunrise. I thought it would be fun to get an early start but it would also be more difficult to get my bearings. After going into a local store and examining a map that they had for sale I felt pretty confident about which road to take to the volcano. I go to bed early (9pm) as I know that I need to wake up early (3am). I am about to fall asleep and try to plug in my iphone which will be my map in the morning but I realize that I unintentionally left my phone charger in Bali. So! I quickly left my guest house to go and look for one. I find one easily at a local electronic store and make it back to my guesthouse to go to bed. My alarm goes off at 3am and it is really dark. I had laid out everything that I wanted to bring with me on my adventure on half the bed. I quickly change and pack my things including a headlamp for the climb. I get on my motorbike that I had rented in Canngu and I am off! The roads that were heavily congested during the day were empty. Stray dogs ran about and I was glossy eyed, fixated on the road. After leaving the main part of town and driving for roughly 20-30 minutes I realize that the headlights on my motorbike are dead… The main part of town had street lights that lit the road so I did not notice it. I am determined to get to the volcano but this was an unforeseen challenge. I pull-off to the side of the road and take-out my headlamp to use as a headlight. I continue on my journey. The headlight was really bright but was not an ideal replacement for the headlights. I am very tired and cannot think clearly. I pull-off to the side of the road again and contemplate my current situation. I am driving in the middle of the night, in a foreign county, on an unknown road, without headlights, driving to an unknown destination. mmm…. 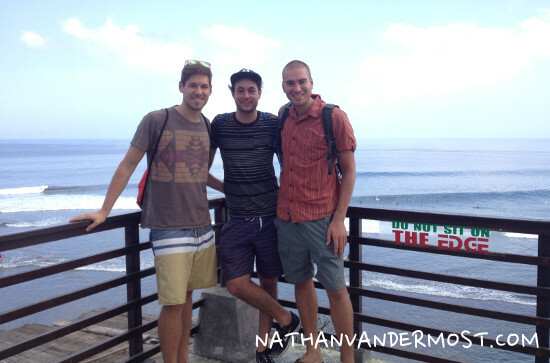 I think to myself, “Nathan, this is not a good idea…” I decide to turn around and go back to Ubud. It was a difficult decision but risking my life to climb a volcano is not worth it. I make it safely back to the guesthouse and decide to attempt the volcano again at sunrise. I get back to the guest-house around 4:30am. I get into bed and reset my alarm for 5:30am. I awake to the annoying sound of my phone alarm and quickly get out of bed. I grab my pre-packed bag and open the door. I am greeted with the sound of roosters crowing. I get on my bike and head in the same direction that I had been just 2 hours prior. It was alot easier to see now that the sun had risen. Many locals were up and walking around, buying food at the local market and getting ready for their day. 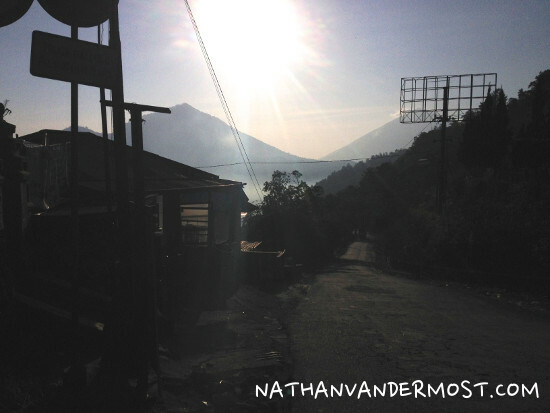 I was on a mission to climb Volcano Mt Batur but had no idea what other obstacles awaited. After driving for roughly 30 minutes the volcano becomes visible in the foreground, with a cloud of mist at its base. The weather looks great with a few clouds and I was feeling warm with the sun’s rays. 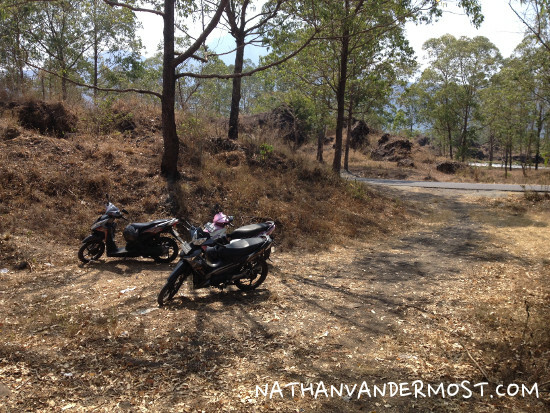 The road from Ubud steadily climbs in elevation towards the base of the volcano. It was funny making eye contact with locals as they looked at me as if I was an alien. Clearly, seeing a foreigner on a motorbike in that area was not a normal sight. The road climbs to a ridge and then descends back into a valley with a lake at the base of the volcano. I stop on the ridge and take a rest. I look down and the road descends quickly into the valley. Huge trucks hauling dirt were using a large swath of the road, going in both directions. After a short rest on the ridge I descend into the valley and I am really cautious as there is a lot of traffic on the road. The road comes to an intersection and I take a left towards the volcano. I hear some locals try to get my attention, “Where are you going?! ?” I ignore them and continue to the volcano. The road continues for a few miles and then there is another road that goes left as if you will drive up the volcano. There is a road sign that indicates that the road goes toward the volcano. I take it but I do not know where it will lead me. After driving for an additional few miles I notice a few small pull-offs on the side of the road and then I see a big sign for Trekking Association. Right after the sign there is a huge parking lot with guided vans and I realize that I have made it to the base of the trail. I decide to turn-around and park at one of the small pull-offs to avoid drawing attention to the fact that I do not have a guide. I park the bike and take a small adjacent trail that appears to go toward the Volcano. 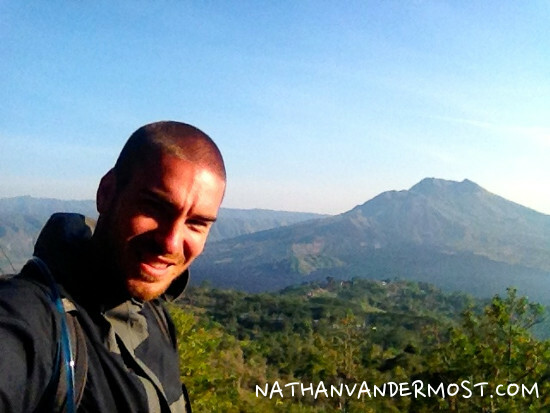 Check out the next blog post for my description of climbing Mt Batur and my interaction with the local guides! Hey, that seems nice. Thanks for sharing.